Upper left: the resistance-wire wrapped bimetallic element of an old-fashioned thermal Voltage Stabilizer. Lower right: a solid-state electronic voltage regulator that can be used to replace it. Notes: this article references MGB equipment, schematics, etc., and the information may not be transferable to other vintage cars. The schematic drawing below, "Stock MGB Voltage Stabilizer Circuit" illustrates how the fuel and temperature gauges are wired. In summary, the gauges are designed to receive a constant supply voltage of 10 Volts and it's the job of the Voltage Stabilizer to provide it. The fuel level and coolant temperature sensors, downstream of their respective gauges, are connected through their mountings to chassis/ground. The sensors act like variable resistors; their resistance changes with fuel level or coolant temperature respectively. The Voltage Stabilizer itself is nominally provided 12 Volts. However, we know from experience that the "voltage in" isn't so stable or predictable! A number of factors affect the supply voltage available, including: the battery's state of charge, the output of the generator or alternator at any given moment (which may be affected by engine RPM), and whether various loads on the system are "on" or "off". Regardless of how stable or predictable the 12 Volt supply is, the Voltage Stabilizer's purpose is to iron things out. As a generalization, you might say: "If the Voltage Stabilizer provides more than 10 Volts, both gauges will read high. If it provides less than 10 Volts, both gauges will read low." However, this generalization isn't strictly true - because the original MG Voltage Stabilizer doesn't actually regulate voltage at all! Instead, it cycles power "on" and "off" to achieve an average voltage (over time) of about 10 Volts. If you take an old-fashioned Voltage Stabilizer apart, you'll find a bimetallic element with a resistance wire wrapped around it (much like an automatic-reset circuit breaker, and not entirely unlike the gauges themselves.) Heat in the resistance wire causes the bimetallic element to bend. The bimetallic element actually bends back and forth quite rapidly, and in turn it rapidly opens and closes a set of contact points. Thus, it switches between a nominal supply voltage of about 12 Volts and a disconnected state (i.e. zero volts!) That suits old-fashioned, single-coil MGB gauges pretty well because they have a lot of mechanical dampening built into them. If your gauges are sufficiently damped, you may not see that their needles constantly wiggling as the Voltage Stabilizer chatters on and off; you'll only perceive the "average" readings they're showing you. By modern standards, thermal Voltage Stabilizers are inaccurate and inconsistent. Their output varies a lot between summertime and wintertime because their accuracy is affected by ambient temperature. Heat under the dashboard (e.g. when your windscreen defrosters are turned "on") can cause a significant shift in gauge readings. Output may also vary over the life of the Voltage Stabilizer as the bimetallic element fatigues, as internal contacts grow dirty, etc. If the resistance wire breaks, the Voltage Stabilizer will simply pass-through electrical current at continuous and unregulated voltage, so the old-fashioned thermal gauges will read high. If your Voltage Stabilizer is old or broken, or if you just want to improve the accuracy and consistancy of your fuel level and coolant temperature gauges, you may want to consider converting to a modern solid-state electronic voltage regulator. IMPORTANT NOTE: if you replace your original MGB gauges with aftermarket gauges, you should probably remove and NOT replace your old-fashioned thermal Voltage Stablizer. (Jumper across the Voltage Stabilizer connections.) Modern dual-coil gauges provides accurate information regardless of supply voltage, but they may not be adequately damped to accomodate the abrupt on/off cycling of a thermal Voltage Stabilizer. 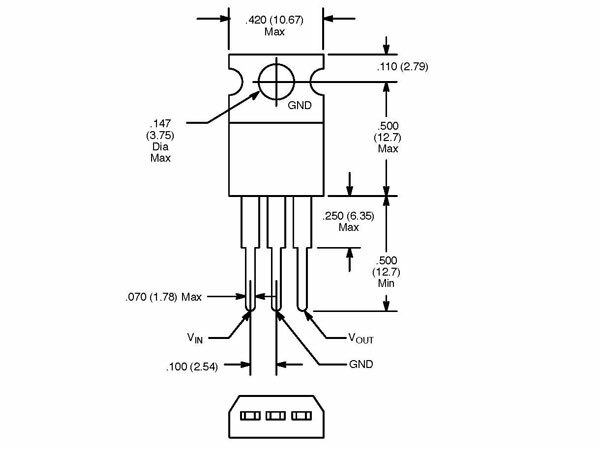 Solid state voltage regulators are inexpensive, but they may be difficult to find locally. The easiest places to purchase them are online. "Google" the part numbers to identify potential suppliers. National Semiconductor's "LM2940T-10.0" and NTE Electronics' "NTE1953" are low dropout (LDO) solid-state voltage regulators. If you supply either of them with a DC voltage between 10.5V and about 30V, they will provide a constant output voltage of 10.0V. Similar to an old-fashioned bimetallic Voltage Stabilizer, they can't boost voltage: so if the supply voltage drops to below about 10.5V, these LDO's will "dropout" and simply pass through whatever supply voltage is available. Note: there are other alternative voltage regulators that could also be used. One example is Texas Instruments' part number "UA7810CKCS" (a.k.a. "7810" or "LM7810") which frankly you're probably more likely to find at your local Radio Shack. The main advantage of the National Semiconductor or NTE Electronics devices is their somewhat lower dropout specification. Also needed: just a few basics including a soldering iron, solder, about six inches of insulated wire, heat shrink tubing (or possibly electrical tape), etc. Optional extras: a small LED lamp and a 1000 ohm resistor. Make sure the solid state regulator is solidly grounded to the metal cover. 2. 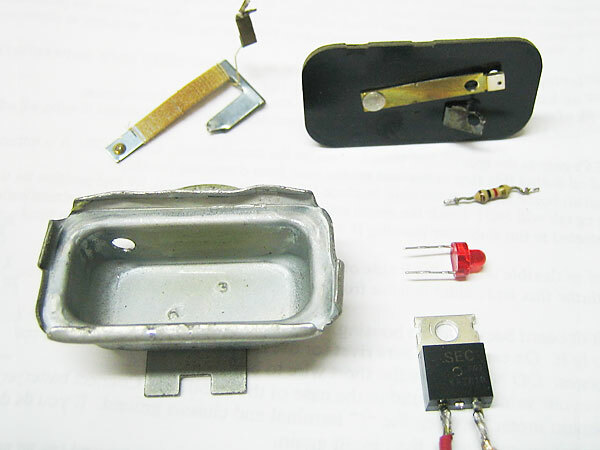 Open the voltage regulator by carefully prying back the tabs that clamp the metal cover to the plastic base. 3. Cut and remove the old bimetallic regulator mechanism, being careful to leave enough of the two terminals for soldering wires onto them later. 5. 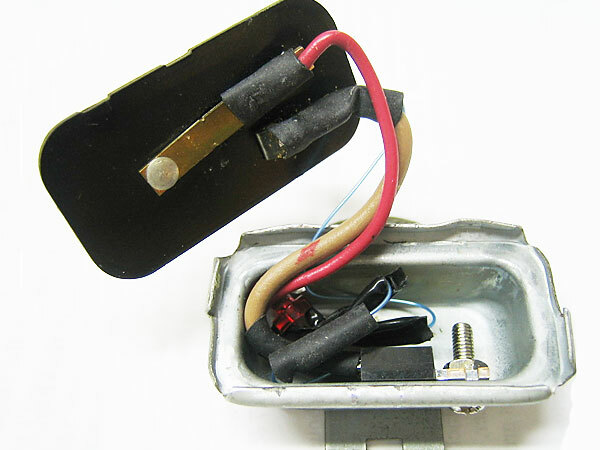 Using a short length of wire, jumper between the solid-state voltage regulator's VIN (12V in) terminal to the "B" terminal on the plastic base. Carefully solder both connections. 6. 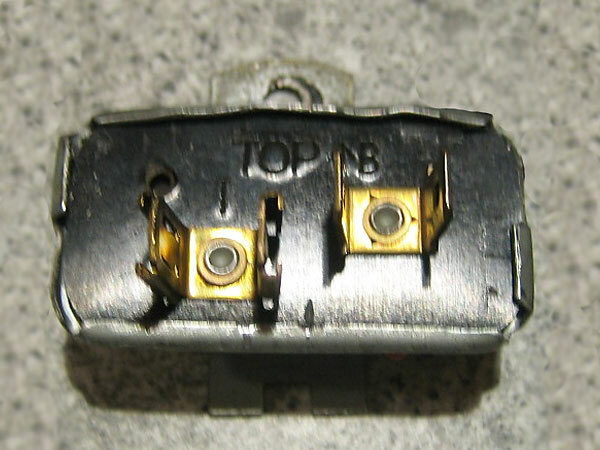 Using a short length of wire, jumper between the solid-state voltage regulator's VOUT (10V out) terminal to the "I" terminal on the plastic base. Carefully solder both connections. 7. The LED indicator is optional. Its purpose is just to show that the system is powered and grounded, and that the voltage regulator is functioning. 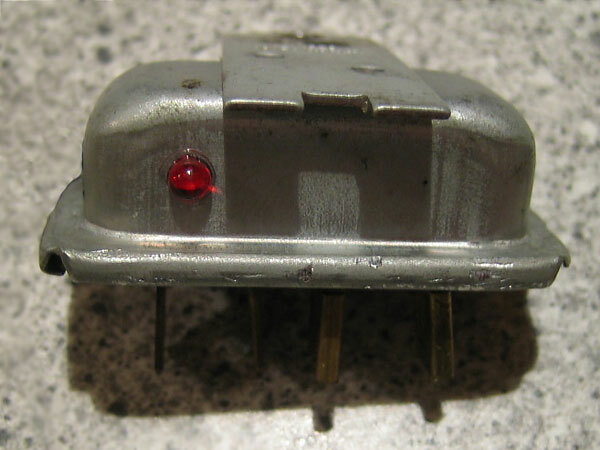 The LED is connected at one end to the voltage regulator's 10V "OUT" terminal, and at the other end it's connected to ground through a 1000 Ohm resistor. 8. To function properly, the solid-state regulator must be electrically well-grounded to the rest of the vehicle. Accomplish this by (first) connecting it to the voltage regulator's metal cover with a machine screw and nut. Note: the voltage regulator itself must in turn be grounded to the car by its mounting. If the fasteners are corroded or dirty, they should be cleaned at this time. Gently fold the edges of the metal cover back over the plastic base. An optional LED simply indicates that the voltage regulator is powered, grounded, and functioning. Disclaimer: This page was researched by Jim Miller and written by Curtis Jacobson. Views expressed are those of the authors, and are provided without warrantee or guarantee. Photos by Jim Miller for British V8 Magazine. All rights reserved. and was used here by permission.